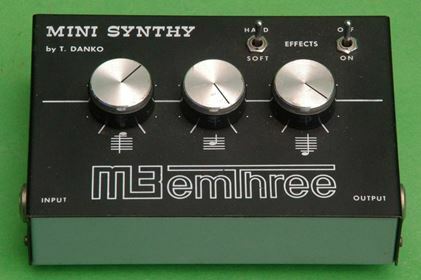 This page displays the information available for the Unknown-M3 (emthree) Mini Synthy (T.Danko) (Sphere item # 7501). To enlarge the image, and access any other images, please click on it. Detailed description, from the owner or the reseller, prices and supported shipment are displayed. Question and answers as well as reserving or bidding for the item are also available on dedicated pages by using the links on the menu. If any word is underlined, you can click on to get more detail. Click on the photo to enlarge it and see more photos if available. Description Another incredibly rare device. I know of two or three of these in the world, but presumably there are more like 100 - it looks quite professionally done, and not at all a bodged hand-made thing. By T. Danko - either the Ukrainian freestyle wrestler or perhaps more likely Tomas Danko, a musician / sound designer from Sweden. 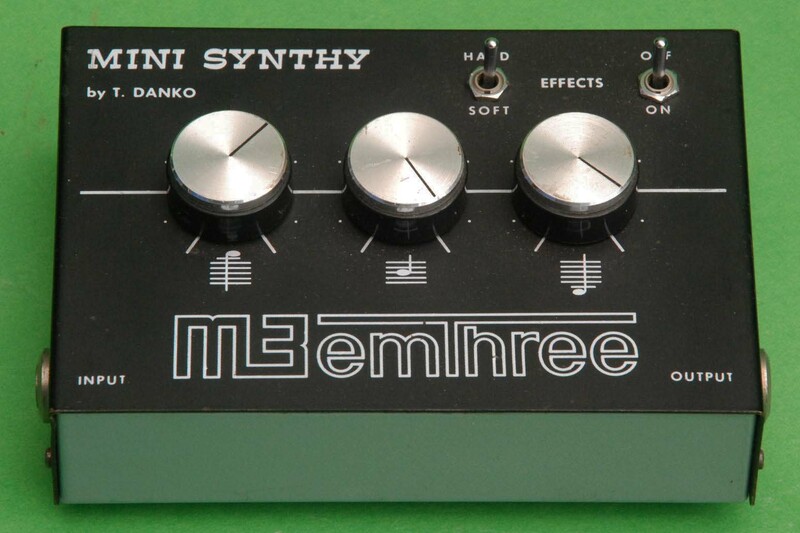 Basically a double octave splitter / waveshaper... with a hard/soft switch which might be better labelled very hard / hard. Not for the faint-hearted. Vat Not from a VAT-registered business. But VAT / duty may be due if importing from outside your trade bloc. Safety All electrical items sold in VEMIA are deemed to be trade sales. No warranty of electrical safety is given or implied. Many items are vintage and would not pass current electrical safety standards. It is the responsibility of the buyer to ensure that items are safe to use in their future environment - if necessary by using the services of a professional. The following section gives you the prices as well as shipment and payment conditions associated with the item. Payment is always requested in GBP. Converted price is shown for information and converted with Sphere standard currency rate. (1) Currency conversion Note that conversion rates were last adjusted on 22 February 2019. They are there to give you a rough guide to the bid price in your currency. Please check for a more up-to-date conversion at http://www.x-rates.com/calculator.html. The bid price will be the actual price in pounds at the moment the auction closes. This will be roughly converted to your currency for your information. For technical reasons, we are unable at the moment to update the conversion from GBP to Euro, although it has changed by well over 10%. If you are in the euro zone please check the current rate at http://www.x-rates.com/calculator.html.